Continuing with the Tandy Tuesday theme initiated by Cindy and to help her use up that bottle of Vermouth I was inspired to make this meal of a Pea, Mushroom and Chicken Pasta. My aim is to make a pasta dish once a week that only makes use of 5 ingredients, other than the pasta and seasoning. 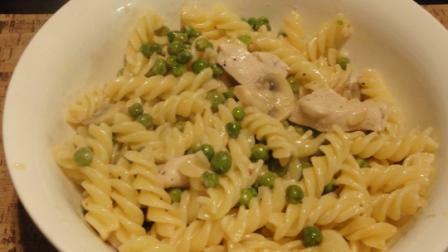 For this wee’s recipe i have made use of chicken, Vermouth, mushrooms and peas. We always have mushrooms in the house and there will always be peas in my freezer. It’s really a nice and useful piece of info. I’m satisfied that you simply shared this useful info with us. Please keep us up to date like this. Thanks for sharing.